FROM THE BOWELS OF THE EARTH THEY CAME... TO COLLECT THE LIVING! A young girl, Mary (KATHERINE MacCOLL), goes into a trance in New York on the day a priest commits suicide in the town of Dunwich. She has a vision of his death, thus reviving an ancient legend of the ancient satanic powers of evil to involve the whole community. A reign of terror soon engulfs Dunwich. Mary reveals to a journalist, Bell (CHRISTOPHER GEORGE), that she has also foreseen a city of the living dead. With the aid of a young psychoanalyst's fiancée, Emily, Mary and the journalist conclude that the psychoanalyst has the ability to combat the evil which is relentlessly destroying Dunwich, which has become a terrified CITY OF THE LIVING DEAD. 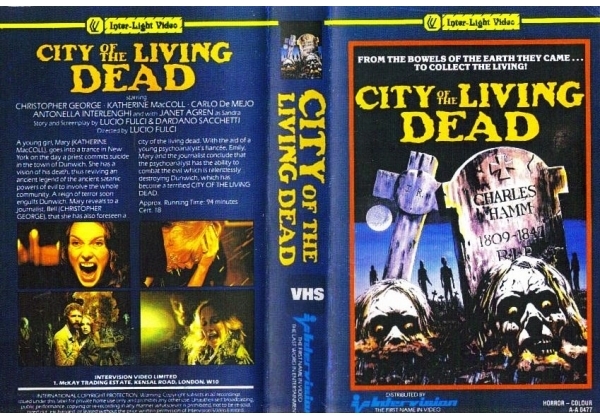 Or find "City of the Living Dead" on VHS and DVD / BluRay at Amazon.